The Funky Felter: Woohoo & Yippee Skippee! I have 1000 hearts on Etsy! Woohoo & Yippee Skippee! I have 1000 hearts on Etsy! I've been selling my funky felted items on Etsy now for a little over a year. It seems the longer that I'm on there, the more hearts per day I get. 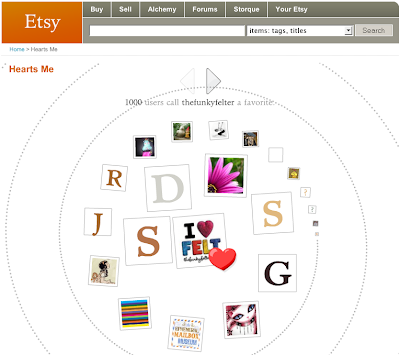 This to me means that more and more Etsy users are finding my shop every day and liking what they see in it. (For those that don't know about "hearts" on Etsy, it is when another Etsy user marks your shop as a favorite.) Just today I reached 1000 hearts in my Etsy shop so that means a 1000 other Etsy users have added my shop to their list of favorite shops. This is thrilling to me! I'm very thankful for each and every heart from my fellow Etsy users!